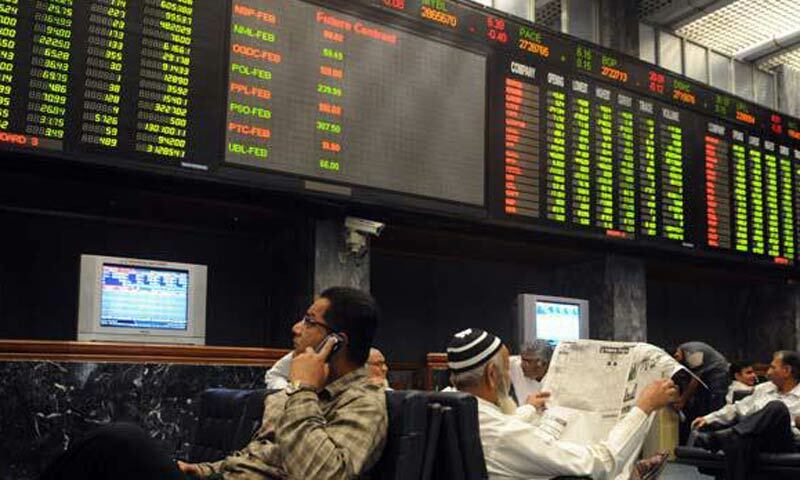 KARACHI: After botched attempts in four previous trading sessions, the KSE-100 index finally managed to cross the 25,000 level and settle at the new all-time high at 25,072 points, posting a gain of 99.10 points on Thursday. The market witnessed considerable volatility, when the benchmark fell below the previous day�s closing at intra-day low of 24917.71 points and jumped to intra-day high at 25,103.41 points. Volumes picked up pace with the number of shares traded rising by 16 per cent on Thursday to 208 million shares, from 180m shares the previous day. Trading value increased by 24pc to Rs8.921 billion, from Rs7.206bn. Market capitalisation was up by Rs10bn to Rs6.042 trillion. The KSE-30 index saw a slower rise of 18.23 points on Thursday to close at 18,729.27. Foreign investors continued the buying spree with purchase of $1.12m worth Pakistan stocks. Bank, individuals and �other organisations� were also on the �buy� side in varying amounts of $0.52m, $0.13m and $0.94m, respectively. However, companies and mutual funds booked profit, offloading stocks valued at $1.42m and $1.30m. Investors still cherished the positive news flow of Wednesday where GDP growth for the first-quarter was projected at 5pc; the pledge by the finance minister to buffer up the foreign exchange reserves to Rs20bn in three years and to keep rate of inflation for the financial year, to a single digit. Also reports of large scale manufacturing posting growth of 8pc aided the positive sentiments. Investors in textiles also awaited the outcome of the EU Parliament vote on granting Pakistan quotas under the GSP plus regime, which kept both major stocks Nishat Mills and Nishat (Chunian) on the firm ground. It was not until the close of the market on Thursday that reports emerged of EU Parliament granting GSP Plus status to the country for a period of 4 years, till 2017. Under the scheme, Pakistan can export most of its textile products to 27 EU nations at concessionary duty rates or duty free, making products cheaper for European importers. Dealers at brokerage Sherman Securities pointed out that the cement stocks continued to show strength and most of the stocks closed up on better earning prospects and possibility of hike in cement prices in January 2014. Engro Corp. and EFoods continued the upside ahead of the Initial Public Offering (IPO) of Engro Fertiliser. Engro was said to be looking forward to agreements of gas supplies at previous rate of $0.7/mmbtu and EFoods was up on expectations that reduction in product prices would results in improved market share. PTC witnessed higher turnover on expectations that a serious crackdown on grey trafficking would help improve earnings of the telecommunication company. The highest increase during the day�s trading was noted in Bata (Pak) up by Rs132.04, while the biggest fall was recorded in Unilever Foods, by Rs188. In all 382 stocks came up for trading on Thursday with gainers at 243, far ahead of the losers at 109 stocks. Another 30 shares remained unchanged. On the top-ten traded list, PTCL was the most briskly traded stock with volume of 22m shares, up 38 paisa to Rs30.94. Colony Mills rose by 42 paisa to Rs5.11 on 15m shares; Jah.Sidd.Co. was higher by 27 paisa to Rs9.22 on 13m shares; Nihsat (Chunian) rallied by Rs1.52 to Rs56.50 on 11m shares and Nishat Mills gained Rs1.12 to Rs119.82 on 9m shares. Fauji Cement recovered another 25 paisa to Rs13.86 on 10m shares; D.G.Khan Cement surged by Rs1.41 to Rs80.71 on 9m shares; Bank Al-Falah was up by 55 paisa to Rs26.09 on 5m shares; Bankislami Pakistan declined by 18 paisa to Rs7.19 on 5m shares and Engro Foods shot up by Rs3.35 to close at Rs100.45 on 5m shares.